There are few things more exhilarating than pedaling your mountain bike through rough terrain surrounded by beautiful scenery. Trainer Josh Moberg of San Francisco fitness performance facility,?DIAKADI, shares?tips?for mountain bikers of all skill levels who want to tackle advanced, long trails. Follow these exercises specific to mountain bikers and make those black diamonds easier to manage. Josh says: "We do a lot of squatting on the bike, especially when we are racing down the hill. It's super important to stay low when descending, particularly off jumps." Beginner: Stand tall with shoulders back, chest out, feet shoulder-width apart and hold a dumbbell in each hand by your side. Breathe in before bending your knees down into the squat position. Keep eyes looking straight ahead and hips back. Slowly bring your posterior up, breathing out and squeezing your glutes as you get back to the starting position. Advanced: Try this exercise on a BOSU ball (flat side up). Josh says: "This is a great exercise for core, legs, posture and upper body strength. We are often bent over on the bike, and having a strong core and legs to support that position is very useful. Also, the pulling action in this exercise is really useful on the bike when you have to pull up on the handlebars to get over obstacles, whatever the terrain might be. An overhand grip is performed during this exercise because that is the grip we have on the handlebars of the bike." barbell with arms straight. Lift the barbell up to your chest using your back and scapula retraction, then back down (similar to a rowing motion). Maintain good spinal posture throughout, using your abdominals to stabilize and support the position. Advanced: Try this exercise on a BOSU ball (flat side up) or on a stability ball. Josh says: "This exercise really challenges your core and upper body strength. Pushing your bike through corners is a technique that must be practiced, and I believe this exercise can help with that. Balance is key in this exercise, and your wrist also has to work hard to balance the kettlebell in your hand." Beginner: Before you attempt this exercise on a stability ball with kettlebells, try it on a flat bench with dumbbells. Advanced: Get into a supine position, lying on your back, on a stability ball with 90 degrees of flexion at knees. Place a kettlebell in each hand. Make sure you stabilize and keep your core and glutes tight. With one arm, raise the kettlebell until your elbow locks, a la a bench press motion, and slowly bring the kettlebell down until your upper arm is parallel to the floor. Josh says: "Grip, wrist, core, chest and tricep strength are very important when handling your bike through technical terrain and longer endurance events." Beginner: Before using a dowel, or cylindrical rod, try this exercise by placing a stability ball against a wall. Place your hands on the ball and push down as you would if you were performing a normal push-up. 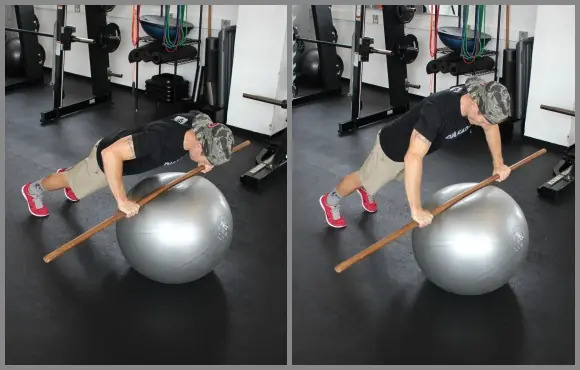 If manageable, progress to the dowel by placing the rod over the center of the ball and proceed to perform a normal push up. Advanced: Position face down with hands on dowel. While stabilizing your core, lower the chest towards the ball and raise up pushing through the dowel. Josh says: "By kneeling on the stability ball, you activate your core, glutes, hamstrings and adductors. Eye-hand coordination is very important on the bike, especially when you run into obstacles and need to react quickly." Beginner: Kneel on a BOSU ball (round side up) first. Try to balance yourself in a good upright posture before adding the tennis ball toss. Advanced: Kneel upright with good posture on a stability ball facing a wall. Next, slowly begin to toss the two tennis balls against the wall with each hand catching the ball while maintaining balance on the stability ball.